Hi everyone and welcome. 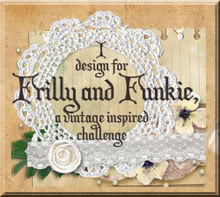 Over at the Frilly and Funkie Challenge blog we are already half way through the latest challenge, 'B Happy'. 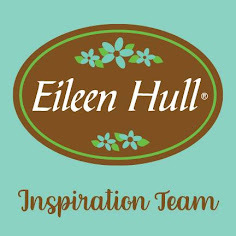 This is what our host for this challenge, Cec Wintonyk, is looking for: "Create a shabby chic or vintage project that makes you happy and features birds, bees and/or butterflies. You must use at least one of these things with wings and it must have a place of prominence on your creation but if you wish to use two or more, please feel free to do that." 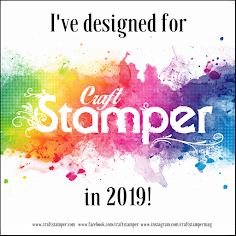 For this challenge theme I choose to make a card incorporating one of the reverse embossed backgrounds created as part of my recent Saturday Showcase over on the Frilly and Funkie Challenge blog. For the background I used a piece of Tim Holtz 'Memoranda' Paper Stash, brayering White Acrylic Paint over before dipping it into a mix of Walnut Stain Distress Oxide Ink and water. As well as adding Remnants Design Tape and machine stitching, I applied Texture Paste through the 'Stitched' Layering Stencil (which has become a firm favourite). That's it for my embossed butterfly card for the current Frilly and Funkie challenge. My talented team mates have also created lots of amazing projects for this challenge so make sure you hop on over and check them out HERE. And remember to link up your own shabby chic or vintage projects to be in with a chance of winning one of the fabulous prizes. This is just so fantastic, Jenny! I love the "old plaster" feel that the background panel brings to the party. Your mason jar filled with wild flowers is so nostalgic and reminds me of a summer afternoon. The stitching, the reverse embossed panel, those sweet little butterflies and the touch of stenciling are such lovely, thoughtful details. And the sentiment sums it all up perfectly. Your cardmaking of late has just been off the charts. You really are a marvel! Wow, Jenny! Just when I think you've made the prettiest card, ever, you go and create another masterpiece! Like Kathy, I love the old world plaster look to your background! The de-bossed Botanical panel is a fantastic backdrop to those beautifully painted flowers. I've been convinced to get these flowers via Zoe enabler, too, but they've been sitting there teasing me. This may just be the inspiration I need! Your talent is incredible! Sending hugs! Wow! I'm very picky about cards but yours have stolen my heart! Jenny, this is my very favorite for this challenge! I love the Flower Jar, and the Stitched detail, and all of the gorgeous layers. You are a true artist! Wow! This is a stunning card. Vintage and lovely. I am in love with your long and skinny cards! The design is just beautifully layered and the flowers so lovely! The mason jar looks realistic with the sweet flowers cut out and layered with the sentiment too! T%his is stunning with the butterflies flitting around the flower jar. The texture and dimension is such a perfect backdrop. This is just a precious card! Wonderful! Ahhh Jenny...your textured layers get me every time. *sigh* Beautiful! Your card is magnificent. I love all the details.